Pan Tianshou (潘天壽, 1897-1971) was a Chinese painter, art educator and art theorist, who was one of the most important traditional Chinese painters of the 20th century. Pan learned literature, painting, and calligraphy as a child in a private school in his village. At 19 his knowledge of Chinese painting was formed when he enrolled at Zhejiang Provincial Teachers’ College in Hangzhou, where he studied with the famous scholars and painters Jing Hengyi and Li Shutong. Like most students of the time, Pan participated in student parades and shared the revolutionary spirit of the May Fourth Movement in 1919. Pan began his career teaching Chinese painting in 1923, when he moved to Shanghai to accept an assignment. In that same year, he met the 80-year-old master of the Shanghai school, Wu Changshuo (吳昌碩), and the two painters became intimate friends. They often discussed painting and calligraphy and Wu gave the younger artist continuous support and encouragement. Pan’s style during this period can be traced back to a variety of Chinese masters, including the Ma-Xia tradition of Southern Song, the Wu and Zhe Schools of the Ming dynasty, and the Qing master Bada Shanren (八大山人). In 1928 he left Shanghai for Hangzhou to teach at the newly established Hangzhou National Art College. Throughout subsequent decades he would devote himself to teaching at a series of art schools and associations, including the Zhejian Academy of Fine Arts. Under the pressure of tremendous Western influences on Chinese painting development, Pan was concerned about the conflicts and interchanges between foreign and traditional elements in Chinese painting. To this end, in 1932 he and his friends set up a traditional Chinese painting society, Bai She (“White Society”), which aimed to develop Chinese painting in the reforming spirit of the Eight Eccentrics of Yangzhou of the Qing Dynasty. He argued that Chinese and Western art were derived from two totally different perspectives and therefore should remain distinct; any compromise between the two would weaken each tradition’s unique nature. In his own teaching, he included Chinese traditions of calligraphy, seal carving, and literature. After 1949, art academies of the new China adopted the style of Socialist Realism, and Pan’s insistence on the traditional inheritance became unpopular. Pan Tianshou’s style took shape in the 1940s and gained full maturity in the mid-1950s. 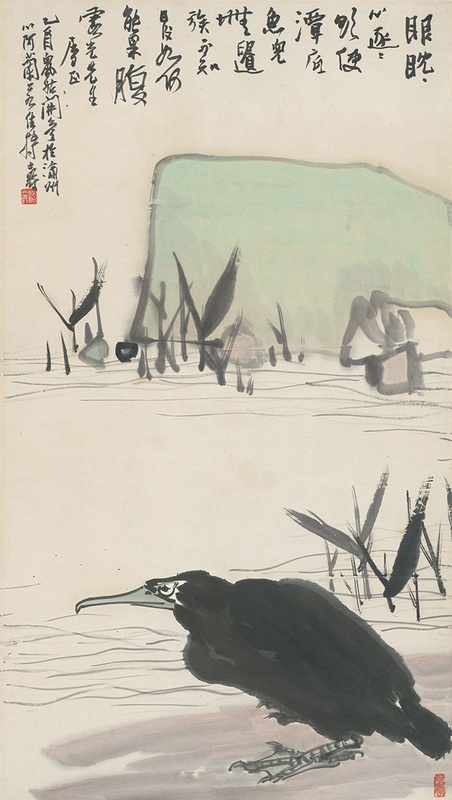 He successfully integrated the traditional subjects of flower-and-bird painting and landscape. Like Wu Changshuo, he applied the aesthetics of calligraphy and seal carving to his painting; but, unlike Wu, he adopted and advanced the forcefulness and heaviness of the Zhe School. His compositions were often dynamic, seeming to balance extreme opposing forces and thus evoking a feeling of danger. His brush was powerful and expressive, inducing a sense of thrill in the viewer. In 1962 Pan Tianshou held an individual exhibition at the newly founded Chinese Art Museum in Beijing, exhibiting 90 works of painting, seal carving, and calligraphy. Soon after the start of the Cultural Revolution in 1965, however, Pan began to be persecuted, and continued to be until his death in 1971.